Bernard Frischer and Anastasia Dakouri-Hild, editors. This book is timely. As the following articles show, 2D and 3D modeling of cultural heritage is no longer used just to illustrate the location and appearance (past or present) of archaeological sites, but also as a tool to discover and recover data from archaeological remains. We have better ways of predicting where this data might be found under the surface (see Gerlach et al., de Boer et al.). When applied to the legacy excavation data of a cultural heritage site—as Lieberwirth does in a pioneering study in this volume—or when used to record the progress of a new excavation, 3D modeling has the potential to mitigate the irreversible and destructive nature of archaeological excavation, an unfortunate, ironic, and unavoidable central fact of archaeology as traditionally practiced. Up to now we have had, perforce, to murder to dissect. With the widespread adoption of 3D technologies to record and reconstruct archaeological sites, we can virtually preserve the site through 3D data capture as we dig it up. And, once we model the 3D data gathered in the field, we can allow our colleagues to retrace our decisions and to test the validity of our conclusions with more precision and confidence. This application of 2D and 3D digital tools in archaeology is not surprising. 2D and 3D models of cultural monuments permit us to visualize their use and evolution from inception through their latest phase. As neurobiologist Semir Zeki has emphasized, vision rarely involves mere sensation; it usually leads spontaneously to cognition as well. First we look, then we see and understand (Zeki 2003: 21, 24, 26, 93). A classic instance is Mendeleev’s table of elements, whose power ‘was not just that it functioned as a tool for arranging properties but that the gaps in the sequences predicted the discovery of yet unknown elements’.4 A second famous case concerns John Snow’s solution of the cause of an outbreak of cholera in London in 1854. By displaying all the cases on a map marked with streets and public water pumps, Snow was able to establish the likelihood that the disease had spread through water contamination at a specific pump. Its handle was removed, and the epidemic promptly ended (Tufte 1997: 27-37). The role of visualization in cognition has not yet become a major theme in discussions of 2D and 3D archaeological models. This is undoubtedly a normal case of theory-lag: since most uses of computer modeling have been for purposes of illustration, it is not surprising that theoreticians should have stressed this application. The field into which 2D and 3D modeling falls was aptly called ‘virtual archaeology’ by P. Reilly in 1990 (see Reilly 1991; Forte and Silotti 1995; Earl 2006). Reilly defined virtual archaeology’s mission as ‘enrich[ing] the perception of the material under study” (Reilly 1989), and “offer[ing]…the most faithful re-presentation of the ancient world possible: highly realistic in information and with a high scientific content’ (Forte and Silotti 1997: 10). In support of this mission, theoreticians of the new field focused on such matters as what software should be used to create or view a 2D or 3D model; viewshed analysis using standard GIS tools; how uncertainty or degrees of probability should be represented; and how 3D models could be used to improve interpretation in museums, in virtual museums, and in the classroom. 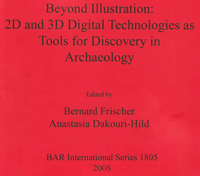 …This historical sketch brings us to the present day and allows us to take stock of not only of which of Ware’s five applications of visualization archaeologists have clearly already embraced, but also to see those that still remain to be employed, at least on a large scale, in our field. Clearly, these are the second and fifth types: promoting the perception of emergent properties; and facilitating the formation of hypotheses. This type of work does more than illustrate an archaeological monument. It helps us to respond to the often tacit assumption that 2D and 3D modeling is primarily for teaching and has little, if anything, to contribute to scholarship (cf. Kolb 1997; Earl 2006: 192-193). It also allows us to use the computer model as a research tool to generate new knowledge. The purpose of this book is to collect some of the pioneering efforts in this promising field. To read the entire Introduction, click here.